This is a VERY special request. I have been educated in so many ways with this recipe and the person who requested it! There are so many of you that I have had the pleasure of "meeting" through messages, and a couple of you in person at Trader Joes! You are all special, you all rock my socks off and without you, Chefwannabe would be pretty stinkin' boring. So, last week-ish, I get a request. 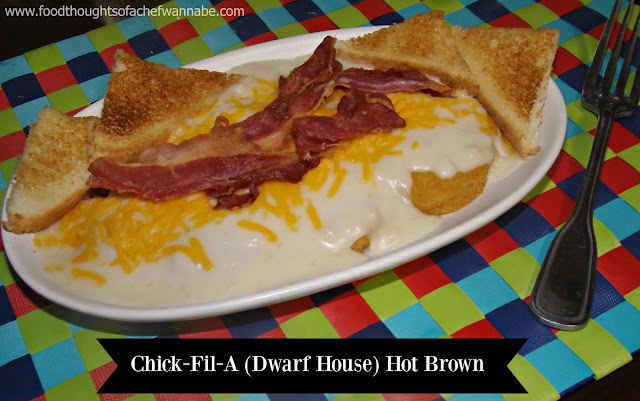 "Can you make the Chik-Fil-A (Dwarf House) version of the Hot Brown"? She continues to explain why she can't get one, "I am unable to leave my home due to cancer treatment and it is the one recipe I can NOT find online". We discuss the dish, what is in it, how it tastes, how it looks, etc. I ask her to describe every detail of it that she can remember. Then we go on to discuss life, and her treatment, what kind of cancer she has, family, meeting our husbands, etc. We became fast friends and learned we had a few things in common! She said I could share her photo and so I want you to meet my new friend, Anna! Gorgeous, inside and out! Here we are chatting it up and I am thinking, she is the one going through these trials, treatments and icky stuff, and she is making ME laugh! In the short time we have known each other, it is clear she is a fireball, and her such a good heart, and sense of humor! So, off I went to attempt to make this lady the dish she desperately misses! Boy was I livin' on a prayer, I had NO idea other than what she said, and the photo of the dish what I was doing! The good news is, I think I got it, she hasn't had it yet, but my husband loved it as well! Obviously unless you go grab nuggets from Chik-Fil-A, you aren't going to have the EXACT same taste but one thing I HIGHLY recommend is that you deep fry your nuggets or make homemade batter dipped ones. I just used frozen, I wanted to get this knocked out as soon as possible for her. But if you don't deep fry they will get a bit soggy and, in my opinion, not good. Here we go! This is not a traditional hot brown like the Kentucky Hot Brown, it is just a version from the Dwarf House she loves! This recipe will serve 4 regular servings or 2 of the restaurant size servings! HA! Prepare your nuggets and set aside. The rest won't take long so they will be fine and the sauce will heat them back up! For the sauce, melt the butter in a small pot. When it is melted add the flour, and let it cook while you stir it for 30-45 seconds. Add in your chicken stock and whisk until smooth and it begins to thicken. When it is thickened add in Parmesan cheese and a pinch of salt and whisk until smooth and creamy. The plating is where this all comes together. 1. Place chicken nuggets on your plate. 2. Ladle over the top some of your sauce. 3. Sprinkle cheese down the center. 4. You can microwave for about 20 seconds if you want the cheese to be completely melted on top. 5. Place bacon strips in the center. 6. Add butter toast points all around. This was awesome! I made one large plate that my husband and I shared. I hope it is exactly what you are wanting Anna, but if nothing else, it is an awesome treat of a dinner! I hope you give this a try. Let me know what you think and if you have had it from the Dwarf House, if it is even close to the real thing! ENJOY and please keep Anna in your thoughts, your prayers! 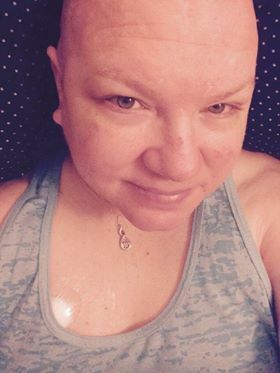 Please send her love, light and healing vibes! I think taking time to make my Batter Dipped Chicken Nuggets would take this OVER the moon! Thank you so much! You just made my year!! Sending you so much love and so many hugs! I am so glad to have you in my life. I am so glad to have you in MINE!!! I am THRILLED to be presented with the chance to do something for you!! Lots of love! Best dish of the Dwarf House. I'm a former Team Leader of Chick-fil-A Vann Drive in Jackson, TN, and our operator at the time took us to Atlanta to visit corporate and see the Dwarf House. Needless to say, it was one of the most pleasant experiences of my life. Thank you for this re-created recipe, and prayers with love go out to you, lovely Anna! Thank you so much! I have never been to a Dwarf House and thought she might be half nuts when she insisted it existed!! I am not sure how close this is to the real deal, but what it is, is decadent, rich and delicious! And Anna will appreciate the prayers and love! Thank you for stopping by, but especially for taking time to share kindness to me and Anna! I live in Atlanta and have eaten many Chick-fil-a Hot Browns. I can't wait to try this recipe. Too bad supper is cooked tonight already or I would do it tonight! Might just go by my nuggets at CHA. Thanks for the recipe. Hugs and prayers for you Anna. I just happened to find this trying to prove my husband wrong. I'm from TN, but have been living in Louisville (Loo-e-vull) for almost 11 years now. He is from GA. When he told me about the chikfila hot brown I almost laughed in his face... No no no I said. The Brown Hotel baby, that's where it originated. Needless to say, who cares. After reading the above, I lost it. Being a 40 yr old, I tend to cry more than ever. So to Anna, many prayers and hugs to you. This is what life is all about. Making friends, making wonderful food and loving each other. I love when someone finds me in a challenge! HA! Sounds like me and my husband! I know Anna will appreciate the prayers and love, I will pass them on to her. Your comment just made me smile ear to ear! I hope you followed me here, or if you enjoy Youtube, FB, Instagram or any other social media come follow me! I need more good vibe, love cooking, and praying friends in my Chefwannabe family! Thank you again for your kind comment, it is my pleasure and again I will pass on the prayers and love!